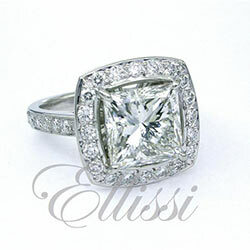 Home / Engagement rings: Custom Design / Round Diamond Rings / “Finesse” Solitaire with channel set Princess cuts. “Finesse” Solitaire with channel set Princess cuts. 1.08 ct round brilliant cut diamond set in four claw cross weave setting in 18 ct white gold. This diamond was EX EX EX F/SI1 with GIA certification. The diamonds in the band are set to half way down the finger and are of princess cut type, 5 on each side. The standard grades we use are of the higher level and F/VS.